Russian director Kirill Serebrennikov, who was accused of embezzling state funds and placed under house arrest, attends a court hearing in Moscow, Sept. 4, 2017. The arrest of prominent Russia's Kirill Serebrennikov has complicated plans to stage the premiere of a ballet he's directing about the late Soviet ballet dancer Rudolf Nureyev at the Bolshoi Theatre, its director general said Tuesday. It is also possible that the ballet Nureyev, originally due to premiere on July 11, will be performed in Serebrennikov's absence, Vladimir Urin said. Russian authorities detained Serebrennikov in August on charges of embezzling state funds, placing him under house arrest until October 19 pending trial. Serebrennikov has a history of criticizing the authorities, but President Vladimir Putin denied last week that censorship or political pressure was behind his detention. "I want to confirm that I strongly hope that we will definitely stage the premiere of Nureyev in the 2017-18 season," Urin told reporters. Urin said he had agreed with Serebrennikov before his arrest that they would meet again in September to decide on the time frame of the premiere. 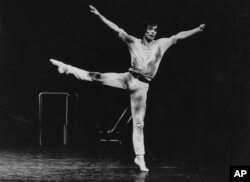 FILE - A 1978 photo of dancer Rudolf Nureyev in "Faun." Urin also said he had asked investigators to allow him to meet Serebrennikov while he is under house arrest. "Now it [the premiere] depends on one person, on what decision Serebrennikov takes — whether he allows us to stage the ballet without him or asks us to wait until his situation has been clarified and that it go ahead in his presence," Urin said. The ballet was pulled in July just two days before it had been due to open. Urin said at the time the performers were not ready and that it would instead be staged next May. Russia's Investigative Committee has said it suspects Serebrennikov of embezzling at least 68 million rubles ($1.18 million) in state funds earmarked for an art project. Serebrennikov denies the charges. Nureyev is viewed as one of the world's most gifted male ballet dancers. His dramatic defection to the West in 1961 was a blow to Soviet prestige. He later served as director of the Paris Opera Ballet and died of AIDS in 1993 aged 54.